Like Donald Antrim, Ben Marcus is an American writer of experimental fiction published in the UK by Granta. 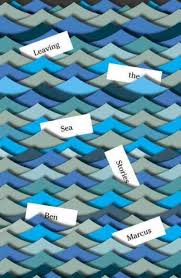 With three novels behind him, most recently The Flame Alphabet (in which children’s language becomes toxic to adults), Leaving the Sea is his first substantial collection of short stories, the oldest of which was published as long ago as 2000. It is split into six sections with the more conventional stories separated from the more experimental until, it might be argued, both forms coincide in the final story, ‘The Moors’. This alienation is demonstrated again and again in stories involving relationships between sons and parents. In ‘Watching Mysteries with My Mother’, the narrator begins, “I don’t think my mother will die today,” and goes on to speculate about death, his mother’s and his own, while discussing the murder mystery programmes his mother loves to watch. Both are fascinated by the mystery of death, though in quite different ways. In possibly my favourite story (though I also loved ‘The Moors’), ‘The Loyalty Protocol’, Edward is reprimanded for taking his parents along to an evacuation drill. The story unfolds with apocalyptic dread, particularly in the light of recent spread of Ebola. In the final story, ‘The Moors’, Marcus uses this experimental approach to recreate a very ordinary incident to great effect. It’s a tour de force of internalised anxiety as Thomas stands in line behind a co-worker he wants to casually talk to, Marcus stretching a few minutes to over forty pages. It and ‘The Loyalty Protocol’ are among the best short stories I’ve read this year. Like Antrim, Marcus is an exciting, original voice in American fiction. You can read some of his stories here. You are currently browsing the archives for the Ben Marcus category.